Arguably the most important change in the past decade has been the shift from the mass media reflecting public taste and opinion to the mass media dictating public taste and opinion. That exemplar of the power of the media the X Factor final airs in Britain today and as chaos theory takes effect a UK record store closes every 2.7 days and Borders UK folds. But all is not quite lost. 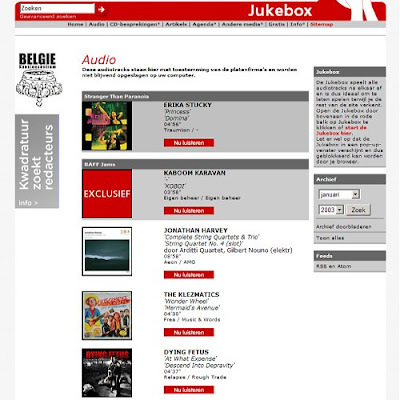 One of the best record retailers in the world is in Belgium and many record stores in that independent thinking country display the Kwadratuur web page above and play the linked audio samples. Despite the Christmas classical releases including such crackers as Sting's If On A Winter's Night, the sole classical representative in Kwadratuur's December 1 selection was the Arditti Quartet's recording of Jonathan Harvey's Fourth Quartet, where it joined albums from Dying Fetus (sic - in more ways than one), 3 inches of Blood, Wu Fei (which I am told is worth a listen) and others. Read about Harrison Birtwistle's cheesy private passions here.